This is mainstream collector's choice for storage of Major League Baseballs. This ball cube features a built in stand to keep the baseball straight with the autograph aligned in front and centered. It has two equal u-shaped plastic pieces that slide together to form a precision fit. 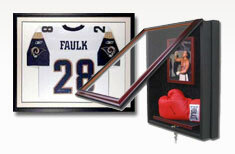 It's the perfect baseball display case for all your autographed baseballs. This baseball holder is made of a high grade Acrylic with a special ultra violet ray protective additive that blocks UV light rays out limiting discoloration of a baseball after a many years of exposure to light, and the fading of a signature. Dimensions are 3.25" square. Baseball not included.